I had considered working with a new green this week, but when I went to the grocery store, I had to go with what looked fresh and inviting. So instead of featuring something new, we’re going back to week 2 and working with kale! 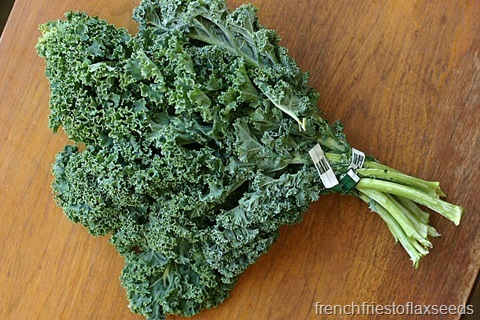 This time though, I went with mature kale – the kind you find in bunches at the store or at your farmer’s market. The kind that looks a little intimidating when you approach it – all curly and gnarled, kinda tough looking. But don’t let that exterior fool you. It’s a great green to use in all sorts of dishes – you just have to know how to treat it right. Mature kale can be a bit tough and bitter as is. You can eat it raw, but you need to massage it (literally) with a good dressing, or blend it up in a smoothie. That won’t take away it’s bitter taste, but does make the texture more appealing. If you also want to combat some bitterness, then you are pretty much guaranteed to have to cook it. The great thing is kale stands up to cooking really well, so you won’t be left with green mushy or slimy stuff in your dishes. 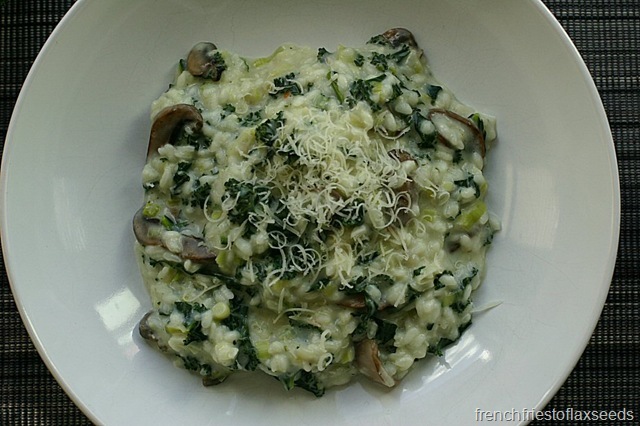 I decided to make one of my favourite fancy dishes – rich, creamy risotto. I love risotto. Whenever I see it on a menu at a restaurant, you can almost guarantee I’m going to order it. Something about that creamy texture, usually with some umami heavy ingredients (like mushrooms and parmesan), it just screams luxury. And the fact that it does take a little effort to make always makes it seem special to me. 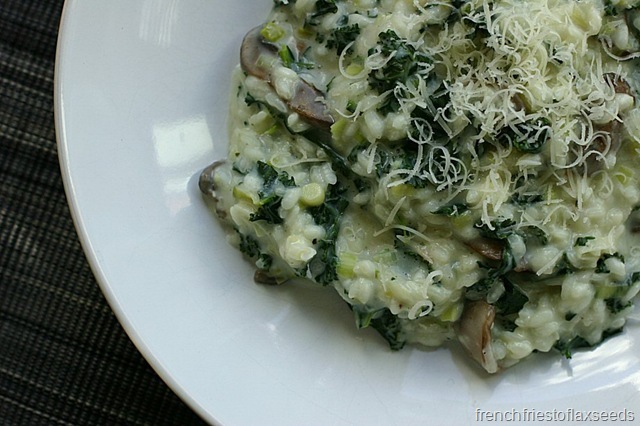 I love the idea of combining something considered super healthy (kale) with super rich (risotto). Not only does it add some great nutrition, just look at how the deep green colour plays off the creamy white rice. So pretty! And something about greens & mushrooms just works for me – they both have an earthiness that compliments each other. 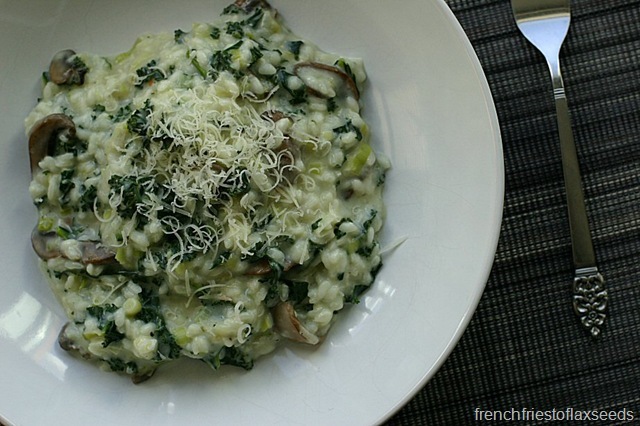 The longer cooking time of risotto also makes the kale soft and mellows out the bitter flavour. So get out there and make risotto. With kale. You know you want to. 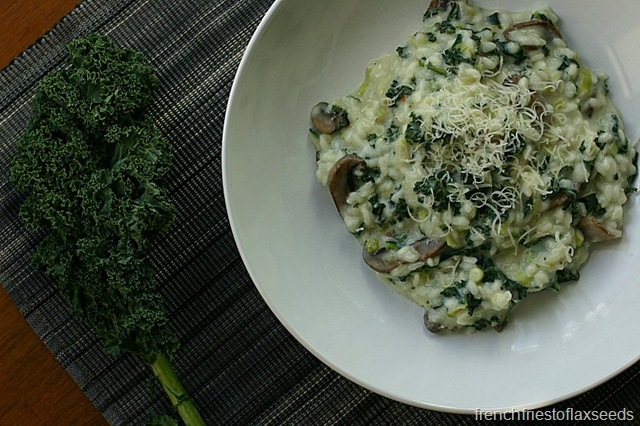 Rich, creamy risotto gets a nutritional boost from good ol’ hearty kale. Paired with earthy mushroom, and topped with a sprinkle of parmesan cheese, this risotto hits all the senses in just the right way. It makes a great meal or side for any special occasion, or just because. 1. In a large saucepan, bring the vegetable stock to a boil, then reduce to a simmer. 2. In a large sauté pan over medium heat, melt 2 tbsp butter, then added mushrooms. Sauté until all excess water has evaporated and they are just turning golden brown. Remove from pan, and set aside. 3. Add the remaining butter and leeks, and sauté until leeks are soft but not brown, about 5 minutes. 4. Add rice, and stir until coated/combined with leeks. Add a ladleful of hot stock and cook, stirring, until absorbed. Continue to add stock one ladle at a time, stirring after each addition until absorbed. Do so until you have used half of your stock. 5. When half of stock has been added, stir in kale, and continue to add stock one ladleful at a time, stirring until absorbed. This whole process should take 18 – 20 minutes. Rice should be tender with the slightest bite once all stock is absorbed. 6. 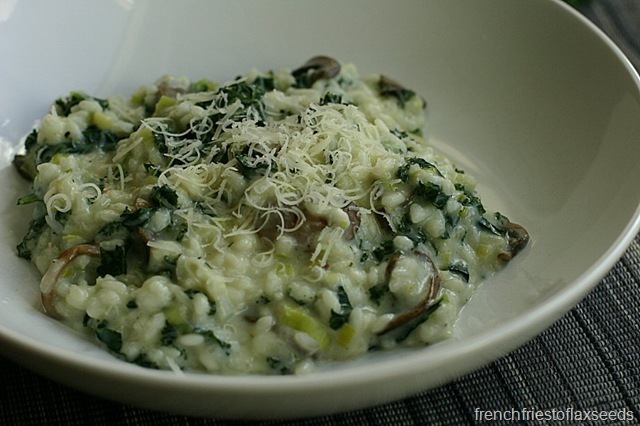 Stir cream and mushrooms to risotto, and season with salt and pepper. Serve with parmesan cheese. Note: You don’t have to stir constantly when you make risotto, but don’t get too far away from the dish either. You want to make sure everything is going well and you end up with a creamy product in the end. Hopefully I’ve inspired you to get out there and cook with some greens in your favourite dishes. Thanks Sobeys for this great opportunity to share my love of all things green! Disclaimer – The author has received consideration from Sobeys or Sobeys’ media partners in exchange for this content. Sobeys has not reviewed these claims and is not responsible for the content. All opinions are the author’s own.